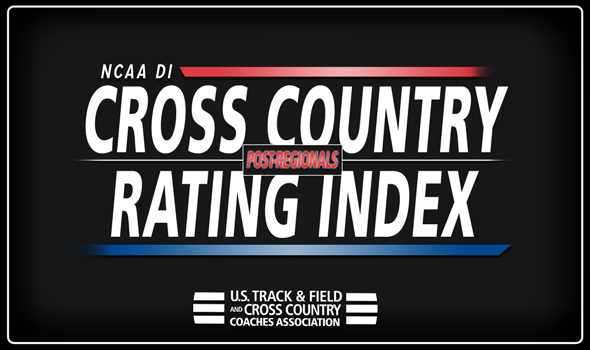 The following is the post-conference championships ranking for the National Cross Country Rating Index in NCAA Division I. A new product we are excited to share: team-by-team resumes. This PDF is massive (PSA: Don’t press print). Over 1,000 pages that show each team’s matchups for the year listing traditional scoring as well as the calculated “dual-meet” score. The number on the far right, in bold, is the AVC score for the matchup with that opponent, which is a combination of the opponent’s Team Potential Index (TPI) plus or minus the “win-share” margin. All of the season’s meets for a team are listed, but, if the meeting doesn’t count for the “AVC Index”, it will be denoted as a “non-varsity” team. The number of “varsity” runners in each race, by opponent, is listed to the right of an opponent’s CCRI national ranking, which is in parentheses. The final ranking is slated to be released after the NCAA Championships on Wednesday, November 21.